The Emeryville pizzeria makes a New York transplant a believer in Cal-cuisine toppings. Hours: Mon.-Sat., 11 a.m.-10 p.m.; Sun., noon-10 p.m.
Few things are more blind than the devotion of a regional food zealot. After spending my formative food-writing years in Brooklyn and Queens, I may have acquired the culinary bigotry that can make New Yorkers such a drag to eat with: "You call that a bagel?!" Thus far, I've shied away from reviewing any East Bay pizzerias for this very reason; I didn't want my provincialism to show. As I acclimate to the topping-focused farm-basket pizza that's so prevalent here, it's important to be fair and balanced in my approach. Emeryville's Public Market just got a staunchly Cal-cuisine pizzeria, the Sacramento transplant called Hot Italian. For a couple of weeks, the local food blogosphere has gone agog over Hot Italian's menu, with toppings like smoked salmon, seasonal pears, and pumpkin purée. But before the newcomer's hype becomes all-consuming, it was time to visit Emeryville's reigning pizza champ: the New York-influenced Rotten City Pizza. 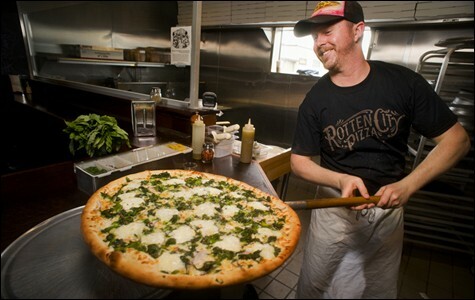 Rotten City's menu of eighteen-inch pies is a hybrid of bicoastal styles. Owner Jonas Bernstein originally hails from Brooklyn, and he tried to create a stripped-down, New York-style pie shop. His chef, John Streit, by contrast, is a pupil of the Bay Area pizza ethos: He spent time at Pizzaiolo and helped open Pizzeria Delfina in San Francisco. The result is a mash-up, with journeyman cheese and pepperoni meeting arugula pesto and organic broccoli rabe. "Jonas wanted a New York pizzeria, but we also stay true to the bread basket of our own backyard," Streit said. And quite a basket it is. After sampling a range of pies, I wasn't bowled over by the New York-style basics, but Rotten City's creative use of top-shelf meats and produce has almost converted me to the California approach. Situated in a nondescript corner shoebox, well removed from the multi-lane asphalt sprawl of Emeryville's main commercial strip, Rotten City is dwarfed by the huge warehouse-style buildings that surround it. Inside, the black-walled, unadorned space revolves around the shop's brightest bit of color: pizza slices under a lighted counter display. A closer inspection revealed that these slices looked withered and exhausted, the cheese puckered and the toppings dry. This was a familiar sight, a reminder of bleary, late-night visits to outer-borough slice shops. While these display models are usually less bruised-up than they look, California's fresh-only ethos has made an impact — I ordered some pies made to order. I gave the basic Neopolitan a thorough New York inspection. Chewy crust with an exterior crispness? Check. Craggy, brown-spotted cheese terrain? Check. Greasy sheen? Check. Foldable slices? Check. Good balance of cheese and sauce? Check. The crust could have used more salt (and possibly some of that mythical NYC tap water) but the biggest issue was the sauce. Crushed tomatoes and garlic went into the oven raw and cooked during the bake, giving the sauce a thicker, paste-like consistency. Its flavor was also strong, easily overpowering the crust and the mild three-cheese blend. The fresh mozz-and-basil-spotted Margherita visually resembled pizza from checkered-tablecloth joints in the East Village, but the thinly stretched crust simply could not withstand the heavy layer of sauce. Each slice was a sloppy mess, barely crisper than if it had been served on raw dough. But while these two openers did not bode well, I hadn't anticipated how much gusto a smart topping program could add. Of all the combo pizzas, I found the Calabrian to be the most artful. It was topped with a house-made Italian sausage (ground with paprika, fennel, and Beeler pork shoulder); Gaeta olives (striking, though milder than a Kalamata); potent Calabrian chilies; and a sprinkling of toasted fennel seeds. At first you notice the fiery chili wallop, then the rich meat and the salt from the olives, finally allowing the fennel's licorice epilogue to linger. The flavors were finely calibrated so no one item hogged the spotlight. The Funghi was topped with a smatter of roasted cremini mushrooms, flavored with toasted garlic and thyme. This pizza was quite flavorful, yet displayed an overall subtlety and restraint. The Bianco Verde was a white pie, with fresh mozzarella and ricotta supplanting Rotten City's standard three-cheese blend. Bright lines of arugula/walnut pesto were swirled over the top, pairing well with the mild cheeses and a dusting of chili flakes. Another white pizza, the Patate Affumicato (roughly, "smoked potatoes"), had thin Yukon Gold potato rounds, slivers of red onion, and pinches of paper-thin ham, spread onto a thick layer of smoked mozzarella. Here the red sauce took a backseat to the deep, smoky cheese hues and the salty ham. This pie was hearty, and deeply satisfying. The limited side menu was further testament to Rotten City's Bay Area bona fides. A generous seasonal salad had red and golden beets with almonds and feta on a bed of arugula. And a hearty meatball sub was made with tender, slow-cooked pork; veal; and beef meatballs on an Acme roll (Streit says this one is a favorite among the kitchen staff of nearby Honor Bar). Waiting 45 minutes one insanely busy rainy weeknight, I watched a cross-section of Emeryville jam into Rotten City's steamed-up little space. A courting couple fed each other half-slices. A mom tried to calm her sugar-amped brood of boys. A stiff-shirted businessman ducked in from the rain. The people kept coming, and there was barely room to move. I visited Rotten City hoping for a little taste of nostalgia. What I found — and what I'm betting is the secret to its obvious popularity — is Streit's mastery of locally-sourced, high-quality California ingredients. It's probably time to stop pining for the slices I left behind, and love the slice I'm with. Pizza That Sings at East End Pizza Co.
Singer-songwriter Paul Manousos turns his attention toward pizza. The results are impressive. The new Berkeley restaurant hybridizes New York, California, and vegetarian approaches.